Get-paid-to sites are a great, fun, and easy way to make some extra cash online. There are hundreds of these sites available, BUT not all of them are worth your time – in fact, many are a waste of time. To get success with these sites, you need to join the best of them. I have therefore created a list with 19 top GPT sites – all of them are legit, they definitely pay, and give you good chances of earning some extra money. 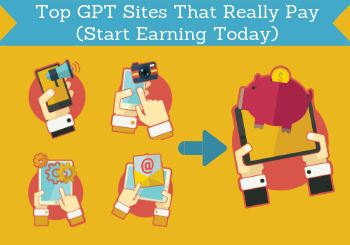 Why GPT sites are a great way to earn! GPT is short for get-paid-to, and GPT websites are sites, where you can earn by doing different tasks online. The exact ways you can earn depends on the specific sites you join. But usually, you can, for example, earn by taking surveys, downloading apps, signing up for free trials, taking online offers, doing micro tasks, play games, clicking ads, watching videos, surfing the internet, participate in free contests, and more. On the list below you can see which sites offer which opportunities, so you can find the ones with the earning methods you prefer. Compared to other ways of making money online GPT sites has some advantages. You can do it completely for free, you will start making money right away, and everyone can do it – these advantages are quite unusual for online money making methods. However, before you start using GPT sites, you need to know what you can expect in terms of earnings. It can be a great way to make some really nice extra money, if you join several of the top paying GPT sites, and use them regularly. You do however need to be aware that it will not be a way to make a full-time income online. If you expect to be able to quit your regular job after joining GPT sites, you will be disappointed, and this is important to know. But if you want to make some extra nice cash when and where you want to, this is one of the easiest and safest ways – you just need to do it with the right expectations. How did the best GPT websites get selected? With so many GPT websites out there, you might wonder how I selected the ones to be on this list. The list has been put together by looking at a number of different factors and by thoroughly testing sites myself. I have for example looked at the number of earning methods, the number of daily opportunities, bonuses, payout methods, payout threshold, user-friendliness, rewards in relation to time spent, support opportunities, and more. Looking at all this together has created the list below to give you a list of the get-paid-to sites with the best opportunities. Which ones are the absolute best for you can however vary depending on the country you live in, and of course on your personal preferences. But on the list below you can see what each site offer, and where it is available, and then you can join the ones that fit your needs and country the best. I want to just again mention that this is not a complete list of all the GPT website out there. I have seen websites for example post a list with the top 100 GPT sites – the problem about this is that a list like this will have a lot of poor sites on it as well, and mostly just have superficial info. I have instead focused on creating a quality list that will make it easy for you to find the best and right sites for YOU, so you can start earning quickly. The list will continuously be updated, as I test new sites and as the current sites develop, so make sure to bookmark this page to keep updated on the opportunities. To get the most earning opportunities, it is a good idea to join several GPT sites. If you have never used these sites before, I recommend joining 5-7 for a start – this will give you plenty of opportunities to earn, and you will still have time to explore each of them and learn to get the most out of the opportunities. You can then always join more later. PrizeRebel is definitely one of the best get-paid-to sites, and one of the sites I have had the most success with myself. It is very easy to use and offers many daily opportunities to earn. You can, for example, earn by taking surveys, taking offers, doing micro tasks, downloading apps, inviting friends, participate in free contests, get free promo codes, and it has a great bonus system, where you get more advantages the more active you are. In addition to this PrizeRebel has some great payout methods, as you can get paid in cash through PayPal already when you have earned $5, which will not take long, or you can choose between many different gift cards. Definitely a GPT site worth joining. Swagbucks is another of the absolute top GPT sites, and in terms of members, it is also one of the biggest. It is easy to use and has a lot of ways you can earn. You can take surveys, watch videos, surf the internet, take offers, get cashback when shopping online, play games, get a daily activity bonus, and if you join through the invitation link below, you will even get a $5 joining bonus. The payout threshold depends on the reward you want, but some rewards you can claim already when you have earned $1-$2. Swagbucks offers to pay out through PayPal and also has a big selection of gift cards, so you can definitely find great rewards here no matter your preferences. ClixSense is a good GPT site, that is fairly easy to use, and it is available worldwide. It especially has many survey opportunities, but you can also earn by taking offers where you can find a lot, you can play games, do micro-tasks, and it has a great daily activity bonus. At times, it can take patience to find the surveys you qualify for, but it, in general, has many opportunities. ClixSense has several great ways you can get paid, as you can get paid through Payoneer, Skrill, Tango card, and in the US you can also get paid through Dwolla or check. The payout threshold is $10. Superpay.me is a GPT site with many daily opportunities. At first, it can take a bit of time to get used to it and learn to navigate, but with a little patience, it gives great earning opportunities. You can, for example, earn by taking surveys, it has many online offers through several offerwalls, you can watch videos, click ads, and participate in its free contest. The amount of opportunities vary from country to country, but it has good options for many countries, and it is very fast to get paid there. You can request a payout already when you have earned $1 and get paid through PayPal, instant PayPal, Skrill, Amazon gift cards, or Bitcoin. FeaturePoints is very user-friendly and a GPT website that is very easy to use to earn on the go as also has a very user-friendly app. You can earn by taking, watching videos, download apps, participate in free contests, and if you live in the US or Canada you can also get cashback when shopping online. The payout threshold is only $1 and if you join through the button below you will get 50 points for free. You can get paid through PayPal, gift cards, or Bitcoin. You can join the GPT site Online Panel NET no matter where you live. The amount of opportunities will however vary, but it in general has a decent amount. It offers paid surveys, offerwall, you can do micro tasks, take deals and trials, and download apps/games, as a way to earn. Some options are really good, and some not so good, so make sure to read the conditions before, for example, taking offers. You can only get paid through PayPal, and you can request a payout once you have earned $10. EarningStation is what I would call a classical GPT site as most of what it offers is very typical for a get-paid-to website. It is, however, only available in the US. You can take paid surveys, watch videos, take offers, get coupons, and invite friends. You can get your earnings out once you have earned $10 and get paid through PayPal, Amazon gift cards, virtual Visa, and many other gift cards. OhMyDosh has some different options than most of the other GPT sites on this list. You just have to be aware that it is only available in the UK. OhMyDosh mostly has cashback offers, and if you live in the UK and shop online it can be a great way to save some money. In addition to this, it has a lot of offers you can earn rewards to sign up for – some of them can really boost your earnings and are really worth it if you just make sure to read the conditions and find the good offers. You can get a payout when you have earned £10 and get paid through PayPal or bank transfer. Rewards1 is one of the more unknown GPT websites but after having tested it, I think it deserves a spot on this list of the best GPT sites. It has quite a few ways to earn as you can take surveys, watch videos, get promo codes, participate in free contests, do a daily quest, play games, take offers, take a daily poll, and more. In the beginning, it just takes a little time to learn to navigate on the site, but then it has many options. The payout for gift cards starts at $1.25 and to get a payout through PayPal you need to earn $5. GrabPoints is a GPT website with a lot of earning opportunities, and it has some of the highest rewards in relation to the time spent. It has a good amount of daily opportunities, and you can, for example, earn by taking surveys, taking offers, downloading apps, watch videos, and take micro-tasks. You can get paid out through PayPal already when you have earned $3, and it also offers many great gift cards as a reward option, or you can get paid in cash through Skrill. If you join through the invitation link below, you will get 500 points as a joining bonus. WowApp is a very interesting GPT option with many ways to earn. It is available in all countries and it is possible to earn both by using the website or the app. You can earn by taking surveys, reading news, get cashback when shopping online, play games, chat and call, and more. While you earn for yourself, you are at the same time earning for charities. WowApp can be a bit overwhelming at first, but with a little patience, it is a GPT site and app with many options and some options that are not available on other sites. Gift Hunter Club is a get-paid-to site that is available worldwide, but it has most opportunities for the US, UK, Spain, and Latin America. Especially if you live in Spain or Latin America this is a great GPT site, as not many have so specific options just for these countries. It does however also offer decent opportunities for many other countries. You can earn by taking surveys, taking online offers, do micro tasks, get daily and weekly activity bonuses, and participate in free contests. The payout threshold is only $5, and you can get paid out through PayPal or gift cards. InstaGC is a GPT site with quite good opportunities for English-speaking countries. You can however join no matter where you live, and you can also find decent opportunities is other countries. You can get paid to take surveys, download apps, take offers, surf the internet, do micro tasks, bet on sports games, and get a weekly bonus that depends on your earnings the past week. The site is fairly easy to use, and it has a great low payout threshold, as you can get paid already when you have earned $1. You can get paid through PayPal, Bitcoin, or gift cards. InboxDollars is an American GPT site, and you can only join it if you live in the USA. It has quite a lot of different ways to earn. You can earn by taking surveys, taking paid offers, search online, shop online, read emails, play games, and more. So it is definitely a GPT site with many opportunities. The downside of InboxDollars is, however, the high payout threshold of $30, which can take some patience to reach, and that you have to pay a $3 fee to get a payout. But you get a $5 joining bonus, which will give you a great kickstart. InboxPounds is a GPT site only for the UK. It is basically the same as InboxDollars just for the UK. The earning opportunities are more or less the same, so you can get paid to take surveys, read emails, take offers, surf the internet, and more. InboxPounds also has a payout threshold that is a bit high, as you have to earn £20 to get a payout, but you get a £1 joining bonus. You can at the moment only get paid through check. Cinchbucks is a GPT with good earning opportunities. It might take a little patience to get to know it at first, but you can find a lot of ways to get paid here. You can take surveys, watch videos, invite friends, get free promo codes, play games, find coupons, and get cashback on a few online shops. Cinchbucks offers to pay your rewards out through PayPal, Bitcoin, or gift cards, and you can request a payout once you have earned $10. Cointiply is only a relevant GPT site if you like to earn Bitcoin or other cryptocurrencies. If you like this, it gives you quite a lot of ways to earn. You can mine cryptocurrency, use a Bitcoin faucet, take surveys, click ads, play games, watch videos, take offers, and more. Many of the options do not have high rewards but are then easy to use. With some patience, it is a great way to get free cryptocurrencies. You can get a payout once you have earned $3.50. 20Cogs is very different than all the other GPT sites on this list. It is only available in the UK. The way it works is that you get different online offers. Some of them are free, like for example, to sign up for free trials or survey sites, and other you have to pay for. But you then get a reward every time you take an offer – often higher than the investment if there is one. Once you have taken 20 offers, you can get a payout, so there is not as such a threshold, but it depends on the number of offers you have taken. With a little patience and if you make sure to read the conditions of each offer carefully, it can be a nice way to earn some extra cash. Timebucks is not the GPT site with the highest rewards, and it can take some patience to earn any real money here. It is however still on this list, as it is available worldwide, and no matter where you live, you will always be able to find a way to earn here. You can earn by taking surveys, taking offers, mining cryptocurrencies, free cash rolls, view content, watch videos, follow brands on social media, and more. It has some earning methods no other GPT site offers, so if you are patient, it can be worth checking out. You can get paid once you have earned $10, and can get paid through PayPal or Bitcoin. That was the list of the top paying GPT sites with the best opportunities if you want to make some extra cash online. Remember that you will get more earning opportunities, if you join several sites, as many of the sites have different offers. The list will also regularly be updated, so make sure to bookmark this page and come back and check it out once in a while. If you have any comments, questions, or know of any great GPT site you think belongs on this list, I would love to hear from you in a comment below. Worldwide, Good pay rates & multiple withdrawal methods. Thanks for the suggestion Ibrahem. I will check it out and test it and if it is good I will put it on the list. Hi please add Rewarding Perks – it’s a brand new site. Thanks for telling me about your new site Rajesh. I will test the site and then assess it and put it on the list if it is a good site. I want paid sites for Bulgaria! Sorry to trouble you. I don’t know where to turn to. Now then… this is something VERY different. This is a truly unique system to rake in easy pay days on ClickBank. There’s no experience required. No prior knowledge required. In fact, you can start right away. You see, this secret video will teach you you an incredible secret that ordinary people are using to make money, quickly and easily, each and every day. Because the fact is that people just like YOU are using just one site, ClickBank, to generate in excess of $80,000 every single month! We are talking about between $3k and $8k every single day! I really urge you to seize this chance! It’s making crazy sums for everybody who gets involved. Please reply and let me know how much you’ve made in your account from this by the end of today! Good you are aware to be careful about such claims. In short, I can say that any program that promises you to become more or less rich in a matter of days without any effort is a program to stay away from. Unfortunately, many people are still willing to promote these programs to earn a quick buck and do not care about the people that will end up losing time and money by following their advice. From what you have sent, I cannot see the actual name of this particular program so cannot say anything more specific. You are welcome to send me the actual name/link via email. I have another website where I review and reveal these types of get-rich-quick schemes. But just from these claims, I can say that it is definitely a program I would stay away from. No, none of them ask you to upload documentation for your id if that is what you mean. On Superpay.me you have to verify your phone number via an automated call the first time you get a payout but you do not have to upload anything. Nice to hear from you. Most in the list – I have an account. That is where the problem is. rejected because you already complete survey A at site X – you know what mean? Yes, I definitely know what you mean Paulino. Many of the GPT sites often have many of the same surveys but then offer different other ways to earn. But luckily there are also many that offer different ones. But because some of them offer the same, I also find it great to join the pure survey sites (the sites that only offer surveys and nothing else) as many of these have their own surveys. In that way I find it to be a great combination to both use survey and GPT sites to get the most opportunities. But it can take a bit of testing to find the best combination of sites not to run into the issue you are mentioning too often. Thank you for quick response. To add…mark the GPT sites that are not strict and reward for surveys are high….Example Survey AA…skip GPT A, if you can complete Survey AA at higher rate at GPT B. Also, some survey they tell you will last only for a few minutes but actually it takes 30 mins which adds to our frustrations. Please sir if you have the time, kindly examine “REMOTASKS” and “HUMANATICS” – Thank you. Good idea to keep track on which sites that have the highest rewards an focus on these. When doing my rankings here on PaidFromSurveys.com I also try to take that into consideration. Thanks for the suggestion for the two sites to look into. I will write them on my list of sites I need to test. which one is the best for iran? I would suggest ClixSense and then I would also suggest you to check out WowApp and Surveytime. we are a gpt called rewardsgate with world wide offers and 20plus offerwalls and we pay via bank and paypal fast and we pay daily. Thanks for making me aware of your site Ramarao. I will join it and test it so I can see what you have to offer and review it. which one is the best for Laos? I must admit I do not know too much about how the opportunities on each site are in Laos. But my guess for the one with some of the best opportunities would be ClixSense. You can also check out Timebucks. I am not sure exactly how many opportunities these sites have in your country, but they should be available. On the list above there are several sites that are available in Egypt. You can for example join ClixSense, PrizeRebel, GrabPoints, and you can also check out the paid survey site Toluna. Toluna ask me accept privacy & 3rd party but not see the option to do it. If you have technical problems when trying to sign up for Toluna, I would suggest you to contact Toluna’s support and they can help you with this. For other sites and opportunities, you can check out the list above and you can also check out the lists with the best survey sites for specific countries I have here on PaidFromSurveys.com. Thank you-I am not surprise that Global Test Market was not in your list. How about this “Survey Compare”? Are you also investigating of quick money scam sites? If you do, I’ll send something for you to investigate. GlobalTestMarket is not as such a GPT site, as it only offers surveys and no other ways to earn. That is why it is not on the list. I have written a full review of Survey Compare you can check out. In my opinion it is a site that is a complete waste of time. On this website, I am only investigating survey and GPT opportunities. But I have another website where I also look into general quick money scams, so please feel free to send me any info or tips you have. Its nice of you to take action immediately. Please see list below. I will write them on the list of sites I have to look into. There are some good sites that are available in Ghana. But I must also say that I do not think they have too many options. But some sites that are worth giving a go are: Surveytime, WowApp, and ClixSense. And feel free to let me know how it goes. Sir which of these site are best for indians? In India you should find a decent amount of opportunities on ClixSense, GrabPoints, Cinchbucks, and to certain extent Superpay.me. If you are mostly interested in paid surveys, I have also made a list of the best paid survey sites in India you can check out. Let me know, if you have any questions about any of the sites. And once you have joined and used some of them, feel free to come back here and share your experiences. Would be great to hear.